Ground Clearance 110 mm / 4.4"
Seat Height 765 mm / 30.1"
Among the most successful Buell motorcycles, the Lightning XB12S made a name of itself by featuring the impressive 1203cc V-Twin engine fitted on a light and versatile chassis. It stands as a naked sports bike, a commuting machine, and a long haul transporter, but if you take it down the track it sure won’t disappoint. It is also a uniquely-styled motorcycle so if you’re in for one, you must love attracting viewers. The bike which inspired its creation is the 1996 Buell S1 Lightning, a naked with loads and loads of character coming from the 1203cc V2 engine developing 86 HP and 107 NM. The strange looking bike reached a top speed of 125 mph so it was a good starting point when Buell thought at building an even greater Lightning together with the new millennium. Buell’s plans became reality starting with 2004 model year when the first Lightning XB12S was produced and marketed. Still a naked bike (fuel in the frame, of course) and still powered by the 1203cc V2 motor, the new introduction was an even greater monster as it got fuel injection, resulting in 100 HP at 6600 RPM and 109.70 NM at 6000 RPM. 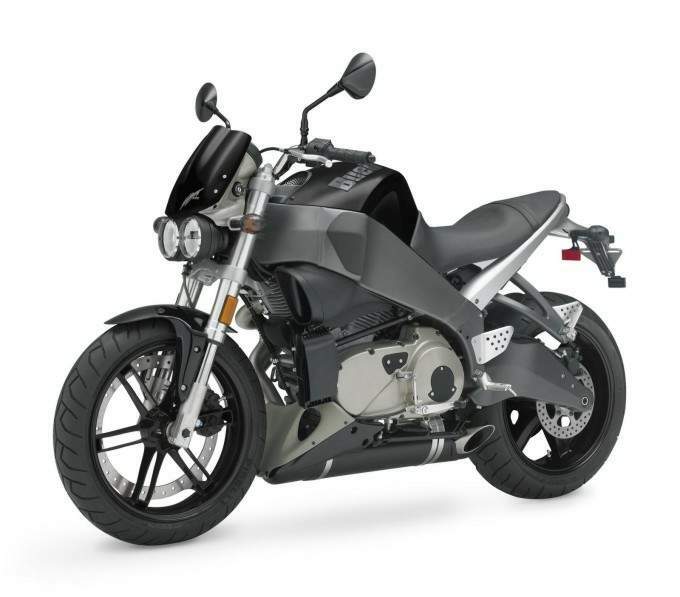 Introduced for the most requiring riders out there, the new Buell featured an aluminum frame and Showa front and rear suspension, features which contributed at raising the sales as well as the 375mm front and 240mm rear brakes. But what really made this bike attractive was its totally new streetfighter-like look. It featured two round headlights underneath a small fairing and the maker minimized the weight to a minimum (394.6 pounds). Colors available for 2004 were: Midnight Black, Racing Red/Graphite-Grey/Translucent Amber. For 2005, the bike was fitted with a 49 mm down draft DDFI || fuel injection system which despite the retuned engine, the numbers on the dyno show less power (92 HP at 6800 RPM) and more torque (113.9 Nm @ 6000 RPM) and it was all due to the transmission belt which was replaced with a shaft drive. Colors in which the 2005 could be covered were: Midnight Black, Racing Red and Thrust Blue. A year later, the Buell Lightning XB12S would of have featured belt drive once again. This feature also contributed at the significant power increase (103 HP at 6800 RPM), while torque remained the same. IIn 2007 the American streetfighter was improved through 52’ wheelbase, 21” rake and 3.3’ of trail. The engine was still the fuel-injected 45 degree V-twin only that air/oil/fan-cooled. Color options were Valencia Orange Translucid w/Translucent Amber wheels. Having a pretty solid past which only brought goodies, the Buell XB12S is also a fierce competitor for the bikes that dare going up against it. One of those bikes which by many is considered the most powerful contender for this American naked comes from the country of naked bikes, Italy. Immediately recognizable due to its unique design features and great character is the Ducati Monster S2R 1000. The biggest monster stands as an impressive combination of power and handling. These are features which would have never characterized this model if it wasn’t for the 1000 Dual Spark engine, Trellis frame and advanced suspension. We’re in for some serious V-Twin competition as this is the most powerful air-cooled Monster (95 HP) which enjoys being revved high and recompenses its rider with great and linear power. The engine features a Dual Spark system which offers more efficient combustion and a healthier feel when the throttle is being opened suddenly. The Italians have never enjoyed a simple thing so they’re in for some advanced technology such as fuel injection and computer engine control. If I knew absolutely anything about motorcycles and you would have shown me these two models one next to the other, I would be 100 percent certain that the bike called Monster is the one produced by Buell. I would be induced in error by the imposing bodywork, aggressive lines and massive V-twin which lets itself be seen just a little bit, enough to leave your lower jaws hanging and your face with no reaction whatsoever. Even though this maker celebrates only 25 years of producing motorcycles (the testimony being the 25th anniversary badge) and it hasn’t got a big history lesson on its back, evolution during the few year of production has let its fingerprint and the final product is a naked that not only lines up with the rest, but gives the tone in matters of design. For 2008, the Lightning XB12S comes with new cosmetic frame protectors and translucid bodywork. Immediately after you swing a leg over it and hit the push button you will feel the Harley engine vibrating pretty strongly underneath you and expect to have quite a harsh ride. I certainly did so, but I must say that the two days of riding the Buell Lightning XB12S haven’t let a bad mark on my lower back and I am not shaking as I’m writing this review. 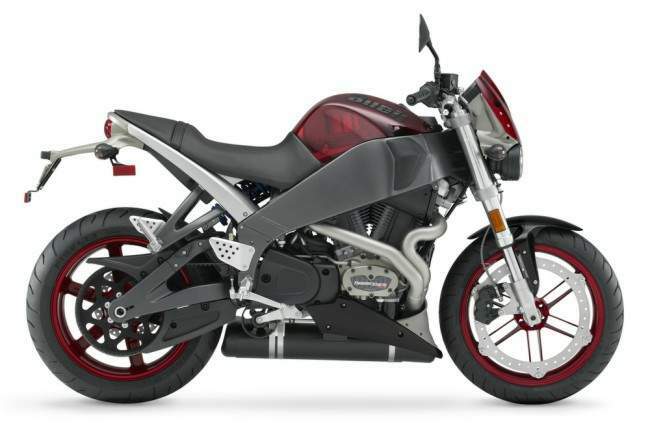 The Buell Thunderstorm 1203 V-Twin engine is this bike’s centerpiece and the real fun source, but without the impressive and versatile chassis, this bike would have been rubbish. As soon as you raise the needle above idle, the impressive low-end torque will have you covered and an even wider twist of the throttle will have you introduced to the powerful mid-range power. This is pretty much what I experienced during the rides I had in the city between stop signs and red lights. All of the four-wheeled vehicles will be left behind and the Lightning will stay in front of most bikes that are ridden in the city, but when your palls on supersports line up, you will feel like the engine’s 6800 rpm limit is fairly low. As you come close to them again at the next stop sign you will remember that for a V-Twin motor, there is an awful great amount of pull, something that always comes as an advantage, no matter a bike’s category. The exhaust noise seems more appropriate to a Ducati or SV 1000 than a Harley and it is all a result of Buell’s interactive exhaust that has seen its way on this bike. Once you go behind the city barriers, there is nothing to stop this raging bull from showing off. The engine will perform impressively and the chassis will dispose of the environment needed in order to make the palls on racing bikes with headlights breath some V-twin smoke. On your favorite twisty roads, the 21 degree rake will sharply have this bike corner, pass up the R versions and leave you confident for the next high-speed turn, but when the straights make themselves seen again your motorcyclist ego will suffer a little bit. I was impressed by this motorcycle’s compactness, aggressive feel and great throttle response. This last feature is mostly due to new DDFI 3 electronic fuel injection ECM. The motor will rev quickly and yet linear all the way up the 6800 RPM redline and all through the five speeds of the gearbox. I decided to go for it and twist the throttle at the max in fifth gear while the naked aerodynamic position was carefully approached. My top speed was 140 mph, enough for this two-cylinder naked bike. Quite impressive I could say! I took the time and adjust both the front and rear suspension in order to ride on a stable bike, but what I noticed was that it became more predictable and implicit, more confident-inspiring. There was simply nothing to stop the Buell from proving its point. The soaking up bumps part was successfully completed so I could concentrate on getting the best off the engine and chassis and hopefully get at the point of meeting in the same day period as my friends. Brakes are simply amazing and I bet you’ll agree with me at this one! The ZTL front brake featuring a 375mm disc and six-piston calipers is capable of stopping an angry bull, not to mention the Lightning made by a manufacturer with an appropriate looking name. Due to the powerful brakes system (240mm disc, single cylinder at the rear) the rider is confident in accelerating powerfully even when approaching corners because it will rely on the performance brakes to have things sorted out in an instant. Quick stops are also a peace of cake. The 2008 Buell Lightning XB12S stands as a commuting machine, a great ride on which to base your weekend escapades and an eye-catcher. Changes during the years have raised its success even higher and if you find your way on one today, I reckon you won’t feel like getting off of it at all.